[By Nick, New for 2014, renamed Coco Mango in 2016] Ahhh, mango and coconut. Those are two words that could make a grown man... I mean Dubba... tremble with fear. It's no wonder why I was sent the free sample of this is new flavor from Blue Bunny. 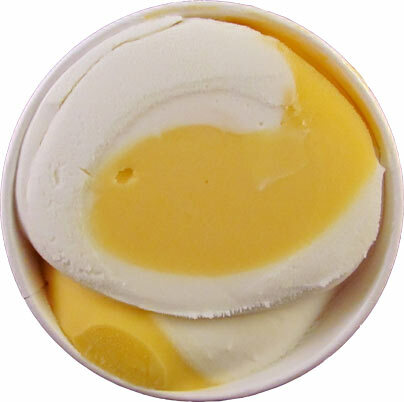 I love mango and have had great success with it on the blog. As for coconut, we're still in a like-hate relationship. Thankfully Wells sent me this flavor in pint form. After my disaster with Turkey Hill's Coconut Cream Pie, I'm not sure I'd know who to pawn this one off on if the same result was to happen. With the lid removed, there are no surprises here. This one looks as advertised. As for taste, the flavors are both shockingly mild. This is a good thing though. You get a strong tropical vibe going on between to the two flavors. Neither one really takes a dominant stance flavor wise. 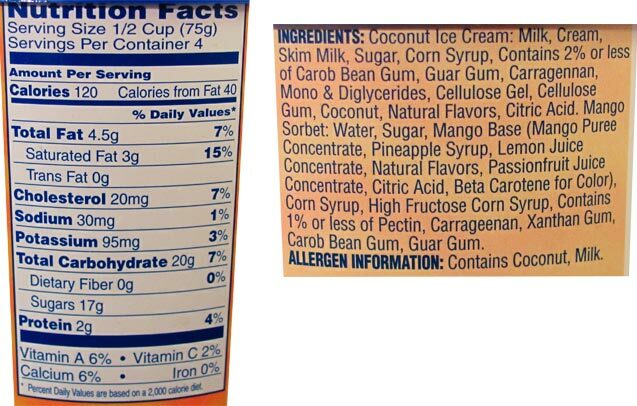 It's also basically a 50/50 ratio of coconut to mango throughout the whole pint. As Dubba would say, the fun factor here is the texture. 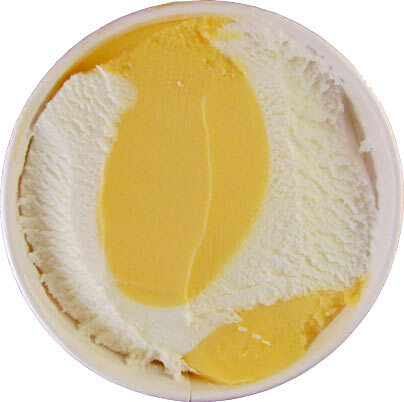 The coconut ice cream adds creaminess to the smooth mango sorbet. If I had to compare it to anything, I would say it's more like a solid version of a smoothie. It's something that's different and a nice change of pace. I thought I might get bored with this one if I liked it but it really keeps you interested especially for it having no mix-ins. I know this is a terrible description but this flavor is just really refreshing. With the weather we've been having in NY, this pint disappeared fast. I'm really surprised by how much I really enjoyed this one. Blue Bunny has a winner here especially with summer right around the corner. If you're looking for something tropical, refreshing and light, this flavor is for you. The Mango sorbet part of the equation is fantastic, tasting on par with Haagen Dazs Mango Sorbet. It's the "coconut" ice cream part that totally lacks, in my opinion. At least for the 1/2-gallon tub I bought, I could hardly taste coconut, and on top of that, it was really, just crappy ice cream. And this is coming from a HUGE Blue Bunny Bunny Tracks fan. Dig your ice cream review site! i agree this ice cream is a winner! I thought there was no way Cocont Mango could ever pull me away from my favorite Bordeaux Chocholate Cherry, esspecially since I dont like coconut.But this is the most refreshingly delicious ice cream i have ever had. Problem is, all the stores in my city stopped carrying it: Why? 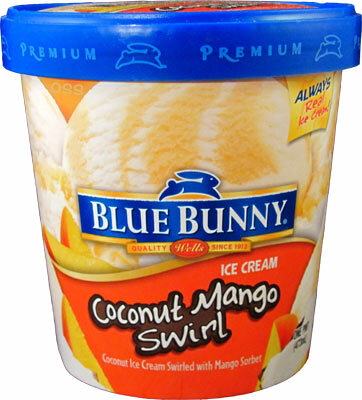 Better question is...Where is the cloest place for me to purchase my new all time favorite flavor... Coconut Mango by Blue Bunny? Favorite Flavorless in Crawfordsville, Indiana.